I am honored to be the featured filmmaker and to present my short film TRAVELIN TRAINS, this Friday, 8pm, June 4, 2010 as part of the RAW: Natural Born Artists event at the great Hollywood screening venue, CINESPACE. RAW Artists is a multi-faceted arts organization showcasing handpicked artistic talents in the avenues of film, fashion, music, art, DJs, models, photography and performing arts. Each month there is a party event promoting the artists and their work. It’s an invite only, cocktail affair. If you want, you can order your tickets by following this link HERE. They posted an interview with me on their site, but I wanted to take this opportunity to expand on some of those comments and offer direct links below. Q- Tell us about yourself. I’m a Filmmaker that’s been based in Los Angeles since 1994. Before that I lived and worked in Atlanta for 10 years. I was born in New England. I went to Emerson College. Q- How did you first get started in film? I started making Super 8 films when I was 10 years old. Lots of three minute in camera editing. I loved going to movies and would emulate the stories with my friends that we saw at the theater. Recently, I’ve reconnected with some of them on Facebook and it’s been fun to share these films from our youth. When I was in college I started shooting in 16mm and video. Haven’t stopped since. TRAVELIN’ TRAINS is a short 16mm black and white film I made a few years back (well, actually more then a few) about a young man in search of his father in depression-era Georgia and the blues music that both joins and separates them. We shot it in Atlanta, grant supported. Most of the script was written in a local Atlanta blues club, “Blind Willies.” I’m excited that people are going to get to see the film on a bigger screen, because these days it is mostly watched on DVD. I think it is the best example of my work as a filmmaker because unlike other projects I’ve done that have producers, actors, clients involved, all the decisions, both good and bad, were my own. I take full responsibility. And here’s a link to “Freight Train Blues” scene from the film. Q- Any other films you’ve produced? I now work professionally as a producer and director after more than twenty years as an Assistant Director for film and television. Not to say I wouldn’t AD again, if the right project financially came along. I still love to AD commercials, but you do a couple of long term projects and you fall out of the loop quickly. I recently directed a five-camera DVD live concert of David Arkenstone and his new band, Mandala. A couple of years ago, I produced the live action segments to the EA video game, “Need for Speed: Undercover.” Directed by Joseph Hodges and photographed by DP Jeff Seckendorf, you can see some clips on my company website, Unconventional Media. TALES FROM THE CATHOLIC CHURCH OF ELVIS continues its award winning film festival run recently winning Best Microbudget Feature Film at The Cannes Independent Film Festival in May. I produced this “shocking” true tale of a Catholic school girl in Las Vegas! Part “Canterbury Tales” meets “PeeWee’s Playhouse,” writer, co-director and lead actress Mercy Malick narrates, as a communal theater experience leeps off the stage and onto the streets of the City of Sin. The acclaimed documentary on the USA domestic energy crisis that I produced with director Nicole Torre, HOUSTON WE HAVE A PROBLEM has also been playing the film festivals, including this week at The Barcelona International Environmental Film Festival and opening at the Downtown Independent in July. I also just returned from a great trip to Western Ireland after producing for writer/producer Diane Namm, a documentary-comedy hybrid, WE’LL ALWAYS HAVE DINGLE. Q- From where do you draw inspiration for your work? I’m drawn to music projects. Music is a huge inspiration. I can’t play so maybe that’s why I love music so much, some of my best ideas happen when I’m at concerts. I also like travel, history and true stories. For some reason, I have never been interested in love stories. Q- From start to finish, explain your process; what does a typical film-making day look like for you? If I’m not working for someone else or shooting a project, then the ideal day starts with emails and reading web updates on Twitter. Lots of good leads and information so I have to watch out that I don’t get sucked in and spoil the whole day riding the internet highway. So, next thing I do is take a walk for an hour, listen to music, to clear my head for some writing. It can be writing a screenplay or writing a one-sheet pitch. Sometimes instead of writing, I’m editing a project. Sometimes I’m editing stuff I shot years ago. I’m convinced that something that you put aside at one point is the focus of your interest another time. Your old films are your assets. I’ve got lots of plans for my old footage. In the evening, I like to have a glass of wine and read the newspaper. If the news doesn’t get me too angry, I check emails again, but sometimes I get lost on the internet trying to get more information. I don’t trust just one news source anymore. I’ve got to know the WHOLE story. At night, I either catch some live music or watch a movie or show on television. I’ve got a big pile of books that I want to read by my bed, but rarely get there early enough to get in some good quality reading. If I do, then I consider that to be an exceptional day. Q- All time favorite film? Q- Are there any filmmakers–past or present–who strongly inform and influence your work? There are many filmmakers that have influenced my work, but I’m most attracted to the filmmakers that try different styles, take some risks with different genres, sometimes successfully, other times not as much. I think a filmmaker is limiting themselves as an artist if they keep doing the same style over and over again. Stanley Kubrick, John Huston are good examples of directors that did different kinds of films. I think Clint Eastwood is proving to be a pretty diverse filmmaker. Q- Are there any specific reoccurring themes or subjects that you explore and deal with most in your work? Not really. As stated above I like diversity. Q- Any previous films/collaborations that you are most proud of? In 1999/2000, I co-produced with director/producer David Zeiger, the 13 part documentary series for PBS,SENIOR YEAR. We are about to release it on DVD and it’s amazing how after 10 years so many of these issues are still the issues of High School kids. It feels very contemporary. I wish more people had seen it and I hope with the DVD release they will. It was a pretty amazing series. We introduced a lot of cinema verite techniques, like diary cams, time lapse, that you see on most reality series now. David is also talking about releasing on DVD the documentary we both produced and directed in 1995, DISPLACED IN THE NEW SOUTH. The film explores the cultural collision between Asian and Hispanic immigrants and the suburban communities near Atlanta where they settled. It was the inspiration for the Indigo Girls song, “Shame on You.” You can see clips from our film in the music video. The interesting thing is the documentary covered issues still being debated in Arizona and the rest of the country. That’s what I mean when I talk about filmmakers keeping their assets, their films. You never know when an interest will come again, look at TRAVELIN’ TRAINS. Q- Why showcase with RAW? Any opportunity to show some of your work on a big screen to a new audience is exciting. I’m honored to be a part of a show at a great venue with a group of artists I didn’t know before. Q- Any current rising stars within the genre that you would recommend we look out for? But I should add, I still consider myself a rising star. I’d still like to direct a feature film. I’ve been trying to find financing for my narrative film, PRESS>PLAY and a couple of times we’ve almost had the money in place. In 2006, I was supposed to direct another feature. We had a cast and location and everything, but at the last minute, the money went dry. I’ve been developing a documentary film on Arborglyphs since 1992 with visual artist/musician Sandy Corley, entitled WITNESS TREES. Now that 3D programming for television is becoming a reality, there is renewed interest. So you never know where it’s going to come from. Just keep working on the projects that inspire you. I guess that’s the “artist” part of me. Thanks for having me. How Social Networks can help. It’s a lot of time and energy to keep up your profile on Facebook, MySpace, Twitter, Linkedin, Ning sites and dozens of other social networking sites. However, if you’re trying to make a living in the creative arts, be it an independent filmmaker, musician, artist, then you’ve got to look at it as part of the job. Here’s just one recent example with my short film “Travelin’ Trains.” A few weeks back I notice Greg Sarni has become a Facebook friend with my sister Lindsay Mofford. Now I remember Greg, not well, but I remember drinking beer and hanging out with him at Emerson College. We reconnect, become online friends. On his Facebook site are photographs and notes about his days running the Boston Blues Festival. 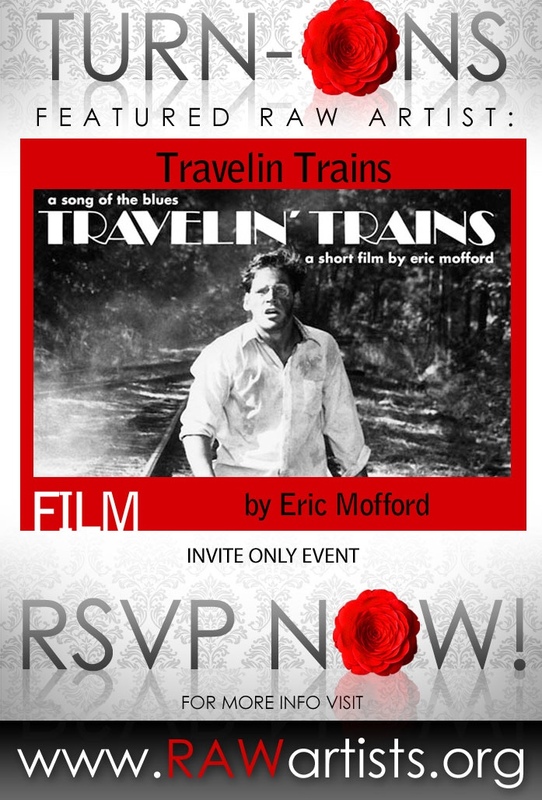 I mention “Travelin’ Trains,” my short blues film about a boy in search of his father in the Depression-era South. It’s full of traditional, acoustic blues. He wants to see it, especially because one of the stars is Chicago Bob Nelson. A few years back, Bob collected the Blues Trust Lifetime Achievement Award. Greg is a fan of his music and makes mention of the prize and film in his online newsletter, Blues Trust. He also adds the Cacchi link where you can see my film for free. The film gets a jump in views including a recommendation on Twitter by the famous Ash Grove bar in Los Angeles. I see the text and Twitter back that we need to do a documentary on the history of one of the most important folk clubs in the country. Discussions and developments begin. Thanks Greg. Do you see where I’m going with all this? At Unconventional South in Nashville, we are constantly talking to an incredible roster of talented musicians who know that the old ways of creating an audience no longer apply. Brian Adams knows this and is developing the network television series “Stone Cold Sober in Music City” with an online home base. You can read more about that venture in a previous blog. We’ve also been exploring that with Billy Falcon, his daughter Rose Falcon and The Sowing Circle on Ustream. A wonderful write up at indiemusictech.com covers what a musician has to do these days to get their music heard. It was also a big issue of discussion at the SXSW music conference as referenced in Wired magazine. Mashable.com is a wealth of information of guidelines, with success and failure stories of what works for artists and entrepreneurs. The write up about Ning job networks and entrepreneur networks are two of my favorite resources. How do I know when there is a new article? I follow them on Twitter. When a new story is online, they’ll put a link on Twitter. I can access it if I’m interested. This process is exactly the same for all us artists. You release a new song, photograph, film, art show and let people know it is there. The fans decide if they want to access it or not. They hear or see it and your network spreads the word. If they’re not spreading the word then something isn’t grabbing their attention. Now I know there are dozens of other social networks including “Ning” sites like my Brother-in-Laws site, All Hands on Board, which can be very specialized. I just don’t feel like I need to be on all of them. It might look like some sort of desperate need to be noticed. You see, there is a fine line and only you can decide what is needed to get the word out and what is too much. We each make our own rules and that, my online friend, has got to be one of the greatest things about social networks.